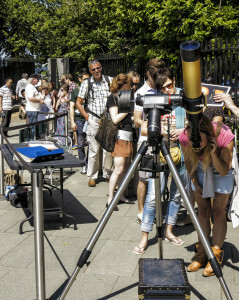 The Flamsteed have been running public solar viewing sessions at the Royal Observatory Greenwich since 2003. The events are run entirely by Flamsteed volunteers. All of the solar viewing equipment that we use has been donated by the Flamsteed Astronomy Society to the Royal Observatory Greenwich for public outreach work. During the 2015 season we had 3,000 members of the public attend 6 public solar viewing sessions at the ROG. NEVER LOOK DIRECTLY AT THE SUN (OR VIA A TELESCOPE OR BINOCULARS) WITHOUT A PROPER FILTER !! Depending on the weather and solar activity, volunteers from the Society set-up Hydrogen-alpha telescopes for public solar viewing sessions at the Royal Observatory Greenwich on some weekdays and weekends between June and August from 11:30 to 16:00 hrs (approx). Sessions will be listed in advance on this page. Alternatively, contact us if you are interested in coming and want to check dates and times. The Flamsteed Astronomy Society have donated to the ROG several solar viewing telescopes equipped with Hydrogen-alpha filters. These special telescopes select only the red light emitted by hydrogen in the outer layers of the Sun, and cut out the dazzling light emitted due to the very high temperatures. This makes it possible to see the prominences at the edges of the Sun’s disc, as well as the sunspots and other magnetic disturbances. Volunteer members of the FAS will supervise public viewing of the Sun through the telescopes when the sky is clear enough, and show visitors that astronomy is not just a night-time activity. All sessions are weather dependent, and a “go/no-go” decision is made on the morning of the event. Check the website on the day for updated information. What is a Solar Telescope? A solar telescope is a special purpose telescope used to observe the Sun. It can either be a standard telescope with added filters, or a specialist telescope with built in filters that can only be used to view the Sun. There are two main types of solar filters: white light and hydrogen-alpha (others, like Calcium-K, are also available, but only useful for imaging). White light filters transmit the entire visible spectrum of light but attenuate it to a level that makes observing safe. They usually transmit only 0.001% of the Sun’s light. White light filters allow the photosphere of the sun to be observed. Unlike white light filters, hydrogen-alpha (H-alpha) filters work by transmitting only one specific wavelength of light, 656.281nm, which causes the red colour seen through these filters. Again, only 0.001% of light is transmitted. H-alpha filters allow you to view the chromosphere of the sun. The majority of scopes that we use in our solar viewing sessions have hydrogen-alpha filters.